In September it is expected that Google will present in its event dedicated to hardware the renewal of its Pixel , with the presentation of its third generation of its mobiles “Made by Google”, now with HTC’s mobile division in its possession . About three months of its presentation, do not pay to see leaks of the new Pixel 3 . If a week ago we knew that they would have a double frontal camera for facial recognition and that the Pixel 3 XL would carry “notch” now their first real images appear . Two photographs have been filtered of what would be the prototype of the Pixel 3 XL . According to the images we see that Google would offer a very continuous renewal, where there are hardly any changes in the back of the device. It only appeared that now between the camera and the flash there is like a new sensor. The biggest change we would find in the front, with its controversial screen with notch that very few people manage to convince. The Pixel 3 XL would hold the double front speaker and would fit a double front camera with 3D facial recognition. 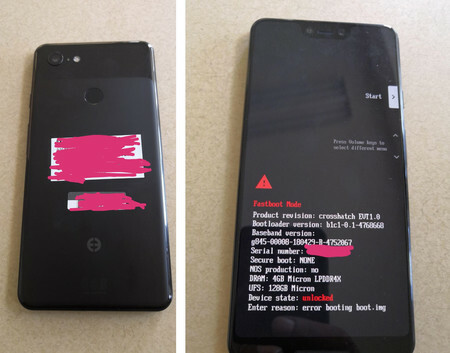 Regarding technical specifications, the boot loader that appears in the photo indicates that the device has 4 GB of RAM , the same as last year’s Pixel 2, and 128 GB of internal UFS storage. As for the processor, except surprise, would take the Snapdragon 845.